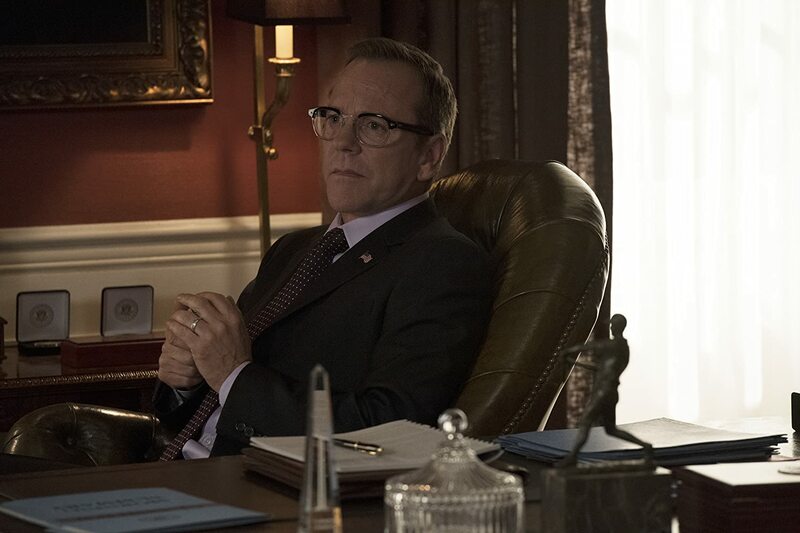 So, ABC cancelled Designated Survivor after its second season, and assuming the Netflix rumours don’t come to fruition, this week’s episode may be the last we’ll see of President Tom Kirkman. Of course as the cancellation was announced a mere few days before the finale air date, no one knew they were making a series finale. Nonetheless, even as a simple season finale, ‘Run’ pains. Yes, the hour gave viewers some resolution to the larger arcs, but too many subplots meant none of them were done well enough to incite much interest. It wasn’t the worst episode the season’s seen, and it wasn’t the best. It was very average, which is disappointing for the last episode we might ever see of Designated Survivor. The hour juggles between disjointed plots and too many locations, from the White House, to London, to a fictional US territory named Taurisi, a sort of stand-in for Puerto Rico. The latter, while demanding independence from the US, experiences a catastrophic tsunami. Seth and Lyor were there at the time and must help pick up the pieces on their side of the waters. Emily is back at work after being shot last week, as though nothing happened. It might just have been a graze, but no real conversation was had about the attack, nor did her colleagues seem concerned. It’s as though the shooting was done purely for dramatic effect, to convince viewers to tune in for the season finale, rather than serving any narrative purpose. Kirkman’s side of things involves trying to secure monetary aid from Congress, only to be blocked by the party leaders. The Moss and Ethan West story continues on the side, with no real development beyond the fact that West realises too late that Kirkman may not be the worst guy in politics. Eventually Tom announces that despite pressures around him, he will be running for another term, and would be standing as Independent. It was a powerful image and a great performance by Sutherland, but it was close to lost amidst the numerous plotlines. Hannah is in London finding Damian’s daughter Amy and protecting her from Valeria. It’s a long story, but essentially Amy was a threat to Valeria because her photographic memory gave her access to all the active British Intelligence operatives. Hannah’s smoking out and killing of Valeria was rather predictable, especially after Valeria taunts her with the fact she has diplomatic immunity. I doubt anyone had any interest in avenging Damian, but that did not prevent the writers from dedicating a good segment of the finale to resolving that arc. The only real surprise to come of ‘Run’ was Hannah discovering that Emily is a traitor, who has been working with the Russians to leak information. Emily being Kirkman’s closest friend and most trusted confidante, such a revelation would have had so much potential. Unfortunately, it’s likely that story is now dead. It is praiseworthy that the season may have been building up to this shocking revelation, as viewers witnessed Emily slowly unravelling, making damaging and morally murky decisions in the name of the President. Such a turn of events would have been the perfect way to get Designated Survivor back on track with a thriller-esque story, more akin to its first season. The first season was unique, engaging, and smart, yet after the showrunners changed for the second season, Designated Survivor suffered a drop in quality and ratings. ‘Run’ was an adequate send-off to the various characters, and went some way to tying loose ends, but it was hardly enough to keep fans craving more. Designated Survivor is available to stream on Netflix.